Sharing chai tea is the East African symbol of friendship. Coming over to say hi…stay for a cup of tea. Waiting in line at the doctor…here’s a cup for the wait. And fellowship hour after church always includes tea. So we are inviting all our Daylight U.S. friends to join us for a cup of tea! The Thanksgiving season is near and we wish to recognize those for whom we are thankful. Come hear inspiring stories from the year: the Doctor team, update on Pembe and Grace, the church in Alale village, and we’ll go over the financial numbers as well. We will also share what Daylight is looking forward to in 2014! A Kenyan Harambee is a celebration with food, singing, and dancing where the community comes together to raise money for someone in need. It is a celebration of community and friendship. In America we tend to run 5k’s or throw spaghetti dinners, but it’s the same basic idea. People come together and have fun in order to help solve problems. One of our board members, Theresa Parks, decided to have a birthday Square Dance in order to help raise money for Daylight bunk beds. Fifty of her friends met in a church basement and ate and sang and danced. A Harambee for bunk beds. The community raised $1,000 for 10 kids to sleep on a bed in Daylight’s new dorm! Below is a picture of a few bunk beds. Mosquito nets (to prevent malaria), wool blankets (for the cold nights), and sheets (because wool blankets can get a little itchy). 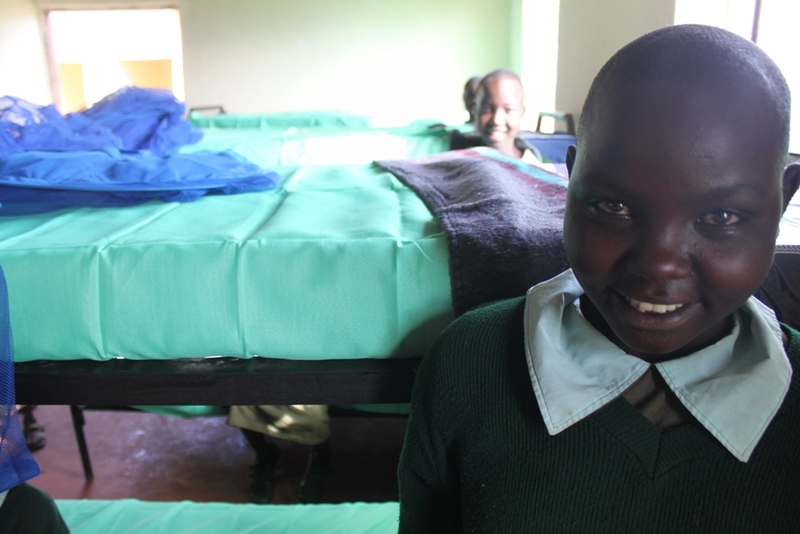 Grace, the young woman who recovered from her ear infection with Lauren, is excited to sleep in her own bunk bed, Until now, she had been sharing a bed with the Kimpur children. Some of you may be aware of a U.S. program called ‘Teach for America’ where college grads get teaching experience and education credits working at schools in economically struggling communities. Well Daylight does something similar in Kenya. Teachers coming out of teacher colleges (2 year technical colleges for teaching) often wait 2-5 years for a job to open up in Kenya’s government schools where an average teacher salary is around $1000-$1500 US dollars. A very good wage in Kenya! Michael recruits unemployed teachers in the community to volunteer at Daylight, many of whom have returned home to live with their parents (just like many unemployed college grads in the U.S.). As a token of gratitude, Daylight pays them a stipend (a fraction of what they would earn as a government employed teacher). Unfortunately, we can’t pay them what they deserve because of Daylight’s financial constraints. But we thank them for their service, remember them in our prayers, and Michael mentors them to be Christian role models in the community. And Michael writes them an AWESOME reference when they go in for their next interview. Thank you for supporting these young teachers. Meet them all on our updated ‘Meet the Staff‘ page.